Virginia DMV drivers have come to the right place for answers to questions regarding the Virginia Department of Motor Vehicles. Here at DMV.com, we have compiled information and instructions on how to carry out common VA DMV procedures. First-time drivers and experienced drivers alike will learn how to perform such tasks as getting a driver’s license, renewing a car registration or transferring a car title. Additional topics covered on our website for Virginia Department of Motor Vehicles drivers include auto insurance, traffic school and how to check your driving record. To continue on in your quest of becoming informed about the DMV in Virginia, browse through the list of topics below. VA residents need a DMV drivers license in order to drive legally. Learn how to get a drivers license, perform a license renewal and more. Request your Virginia DMV driving history online in 3 easy steps. Ordering driving records online lets you avoid waiting in line at the DMV. Compare auto insurance rates at our online car insurance center. The VA DMV requires minimum car insurance for cars registered in Virginia. Take the best DMV traffic school online to earn safety points or fulfill a court order. Our online traffic school is approved by the VA DMV. Take a DMV practice exam to test your knowledge of the VA DMV drivers manual. Passing the DMV practice test will help you earn your license. Perform your VA car registration renewal entirely online. Renewing car registration documents online saves you a trip and a wait at the DMV. Enroll in drivers education today to meet Virginia DMV licensing requirements. VA online drivers ed is available for home-schooled students. A Virginia bill of sale records a transfer of vehicle ownership. Learn how to get a DMV bill of sale after buying or selling a car in VA. Learn how to pay traffic fines online if you earned a ticket in VA. Drivers must pay traffic citations to keep their DMV driving privileges. DUI penalties for a first DUI in Virginia include a fine and one-year license revocation. Learn other DUI consequences enforced by the DMV. Learn how to purchase a car in Virginia the easy way. Buy a car online to simplify DMV tasks like registration and obtaining license plates. Find the Virginia DMV office closest to you. Learn VA DMV hours of operation, get DMV contact information and more. 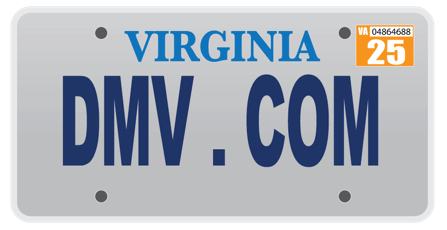 Find all the latest facts on the Virginia Department of Motor Vehicles quickly at DMV.com. This site is privately owned and is not affiliated with any government agency, so you don’t have to deal with the government bureaucracy. Regardless of what type of vehicle you own or drive, we give you all the specific requirements regarding driver’s license, registration, auto insurance, replacements, renewals, etc. Your desired VA DMV info can be found in our carefully written articles. Although our website already contains many helpful facts, our readers are more than welcome to help us by contributing to the site with their comments, edits, questions, etc. Also you can check out our Facebook page and share thoughts there as well. You can navigate the site in two ways: by using the “search” feature or the navigation sections. Choose which ever you like and find the info you need. Our mission is to provide our readers with all up-to-date information regarding driving and licensing issues, and help them deal with them. We deliver the information quickly and in easy-to-understand format.